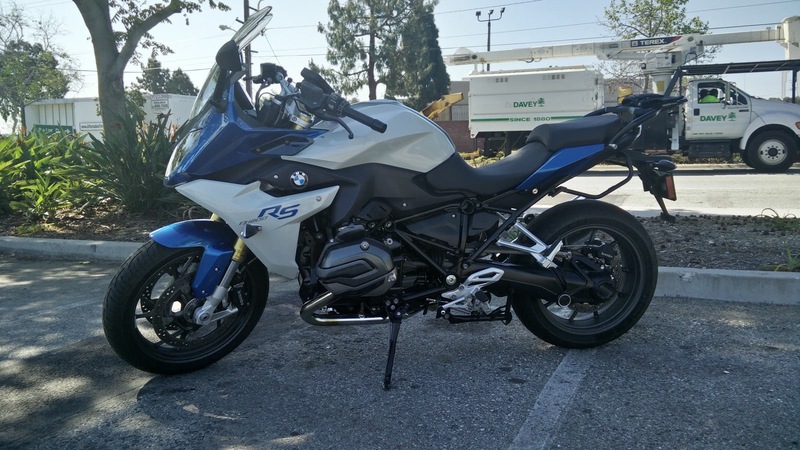 Upon first inspection, the R1200RS bears a pretty close resemblance to the R800ST, a bike that to me has slightly awkward proportions with the fairing feeling a bit taller and the bars being a bit more upright than my own K1200S. With the adjustable windshield in the taller position, the bike looks a bit more dorky since windshield has a much more vertical rake. It is definitely not the prettiest bike, especially with the big lumps of the cylinder heads hanging through the sides of the fairing. However, there is no question that the RS is a technologically impressive bike. It uses keyless starting, has available adjustable suspension, multiple ride modes, adjustable traction control, quick shifter, and one of the most sophisticated monochrome TFT displays I have seen on a motorcycle. 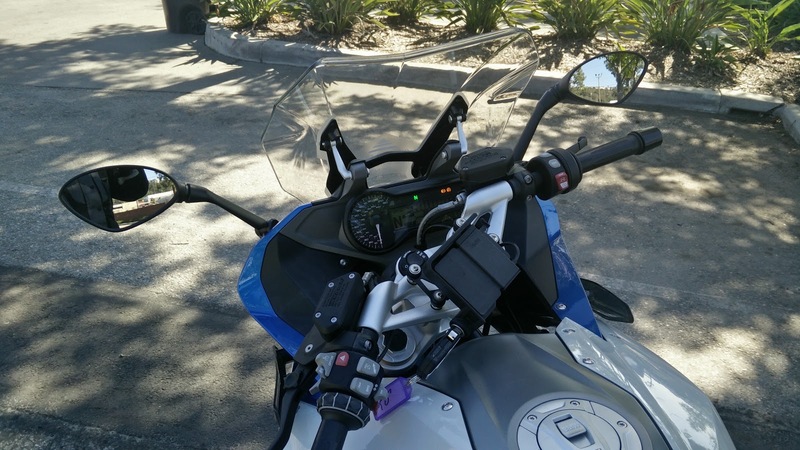 There is even an option for a factory GPS mount that is linked to the scrolling controller on the left handlebar. Sure my own bike has a few of these items and I have ridden other bikes with a few of these, but never a single bike with all of this tech included in one. Probably the one bike that comes the closest is the Ducati Diavel, though the price tag for that is about 50% higher. Throwing a leg over the optional low seat, which I would definitely skip if I were to get the bike, and firing up the boxer motor, the RS thrums to life with the vibration expected of such a large twin. However, unlike the last GS I rode, the RS does not exhibit the same tendency to want to tilt that the older GS model did. 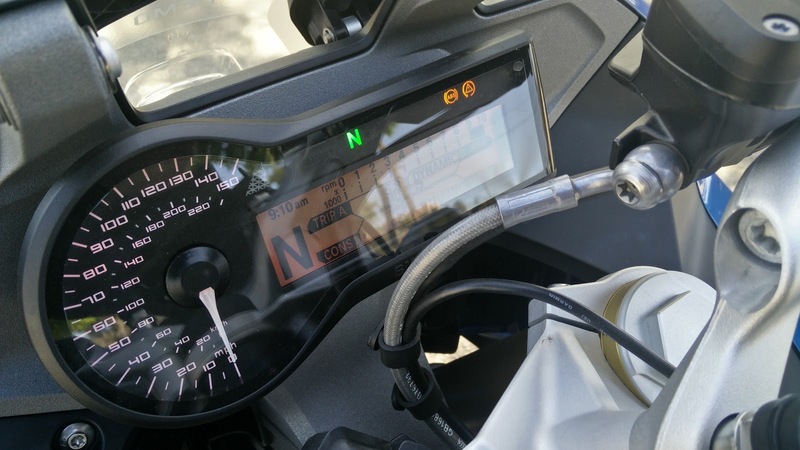 Whether this is a result of the new partially water-cooled motor or other changes made to the chassis, I cannot be sure until I get a chance to ride the new GS. At rest, the engine vibrations are much less noticeable through the handlebars and foot pegs, another bit of character common to big boxer engines. Slip the buttery smooth gearbox into first and engage the super light clutch and I am on my way, riding the wonderful wave of torque that is the defining characteristic of BMW's boxer motors. This bike absolutely pulls from low rpms, even in high gear. 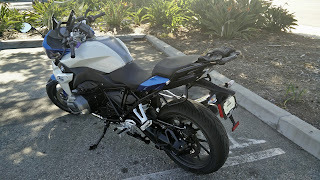 It produces strong power that the K1200S inline-four simply cannot match at parking lot speeds. I am able to ride around with minimal shifting because the boxer makes all that torque down low, but still has a reasonably high redline, allowing a great deal of flexibility. Plus, shifting is not terribly enjoyable as the light clutch translates into a friction point that is difficult to get perfect, making the shifts a little less smooth than I would like. Sure if I owned the bike, I would be able to get used to it after a few days, but I have jumped on a variety of other bikes whose clutches did not require such strange recalibration. And forget about the quick shifter if you are looking to make smooth shifts, especially at anything less than 50% throttle. Wailing on the bike like there's no tomorrow? 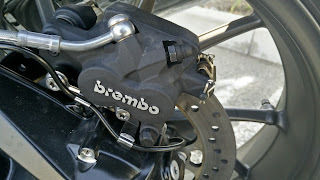 Then the quick shifter works great. Cruising around town and popping back and forth between second and third or third and fourth, prepare to have every shift met with a shudder. Luckily, the suspension is excellent. As a middle-weight bike, the adaptive suspension instills a fantastic confidence. The bike is not exactly light at 531 lbs, weighing about as much as my K1200S, but despite having a traditional fork, the bike feels like it can corner on rails after getting over the initial slightly sluggish tip-in. Once leaned over, it is as stable as a rock, and even in the "Dynamic" setting, it soaks up mid-corner bumps with aplomb. Of course, that stability translates into a slight reluctance to change direction, but that also means incredible straight line stability for touring long distances. For a sport touring bike that is more geared towards comfort, that is precisely the right combination. Riding along at sedate speeds, the bike feels very similar to the big GS, albeit with a rider triangle that is a bit more sporty. Dial up the speed and the starts to really separate itself from its adventure sibling. 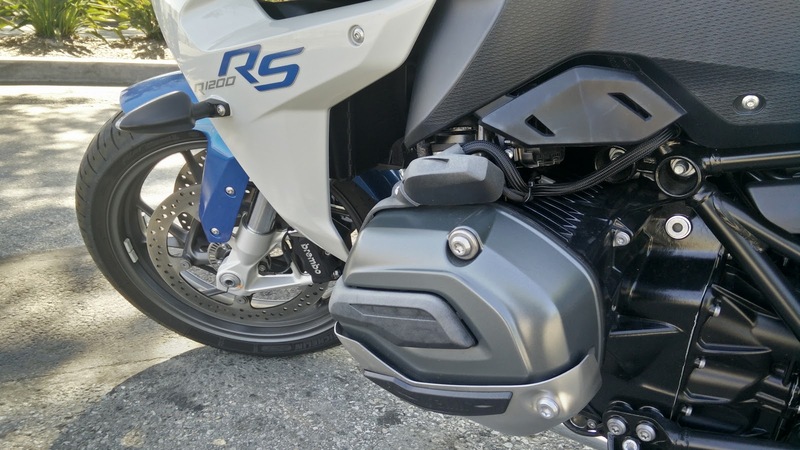 The crisper throttle control, more aggressive seating position, and different tuning of the ABS and stability control systems allows the RS to feel at home plugging along for miles on end and able to tackle any on-road obstacle that is thrown at you. Everything about this bike feels purposefully thought out for distance riding, including the absolutely massive side cases that are available as an option. 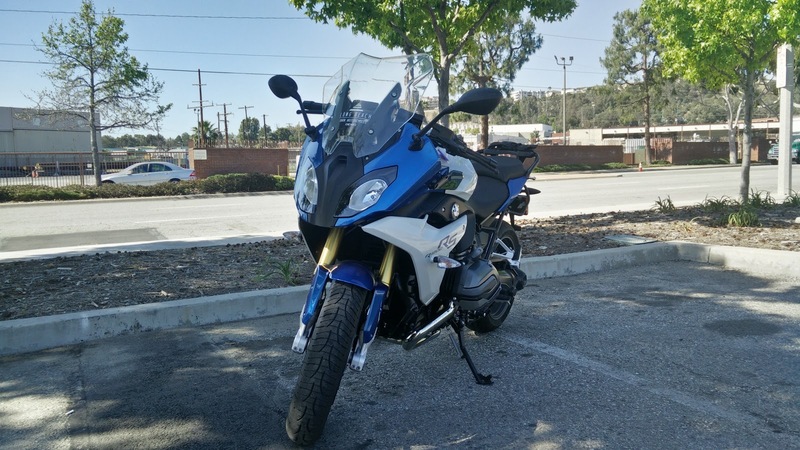 If only it had a slightly larger fuel tank to provide longer distances between stops it would probably be the perfect choice for a lot of aging sport bike riders looking to switch things up for something more comfortable. Of course, at the end of the day, I have to admit that I cannot see myself getting this bike for me. 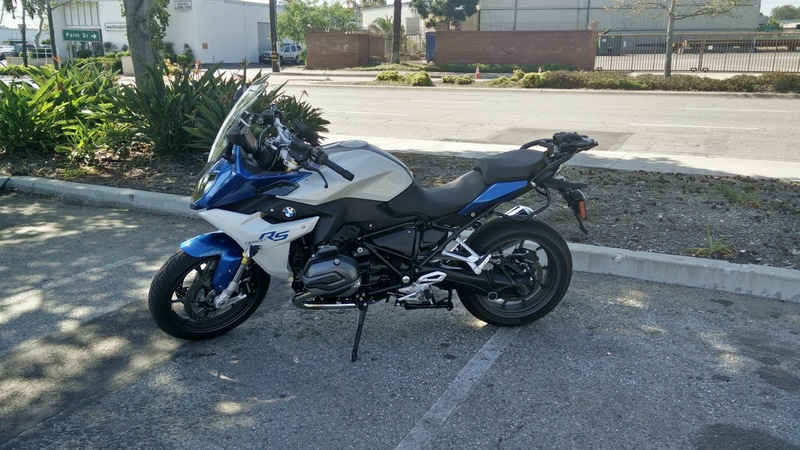 Fundamentally, this is a great bike that provides a lot of excellent features and packs a huge technology improvement over my K1200S. 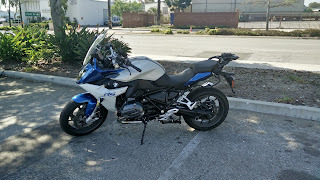 However, it lacks the same kind of thrilling performance that the K1200S is able to offer and there is not enough about it that is different enough from the K1200S to make me willing to overlook that loss of performance. I already have the electronically adjustable suspension and ABS and have not seen a real need for things like stability control or adjustable ride modes. The trick proximity key is definitely more a nice to have and not a necessity while the GPS integration is unnecessary with the comm unit linked to my helmet feeding me audible directions. But if I were transitioning to the sport touring category for the first time from a supernaked or an older sport bike, I would absolutely have this bike near the top of the list.